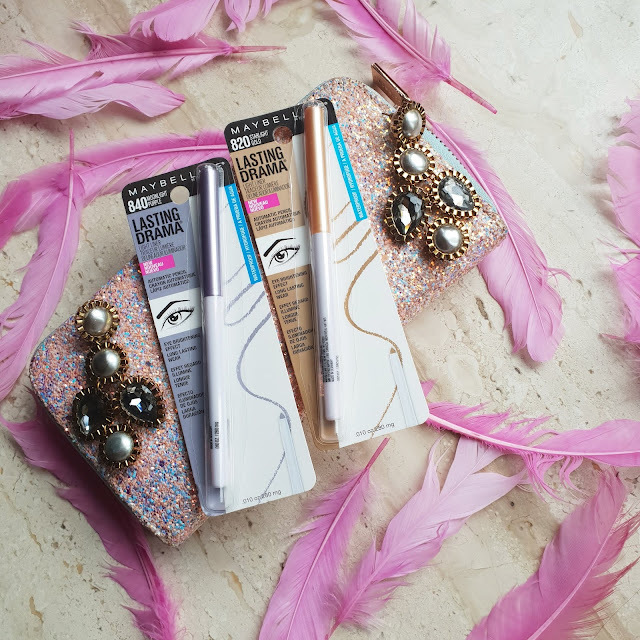 Its again New launch from Maybelline. They have got the New Lasting Drama Light Liners and Color Sensational lips shaping liners. 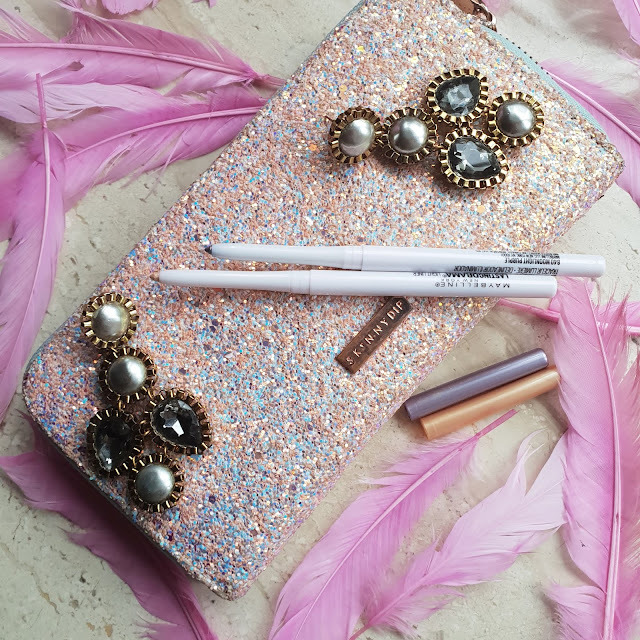 So we have eye pencils as well as lip pencils to review in todays post. Light liners comes in a white packaging and they are launched in 5 different shades. Moonlight purple a sparkly lilac shade and Starlight Gold which is a champagne gold color for bright and lustrous eyes. Twinkle black, White luster and Shiny bronze are the other 3 shades in this range. 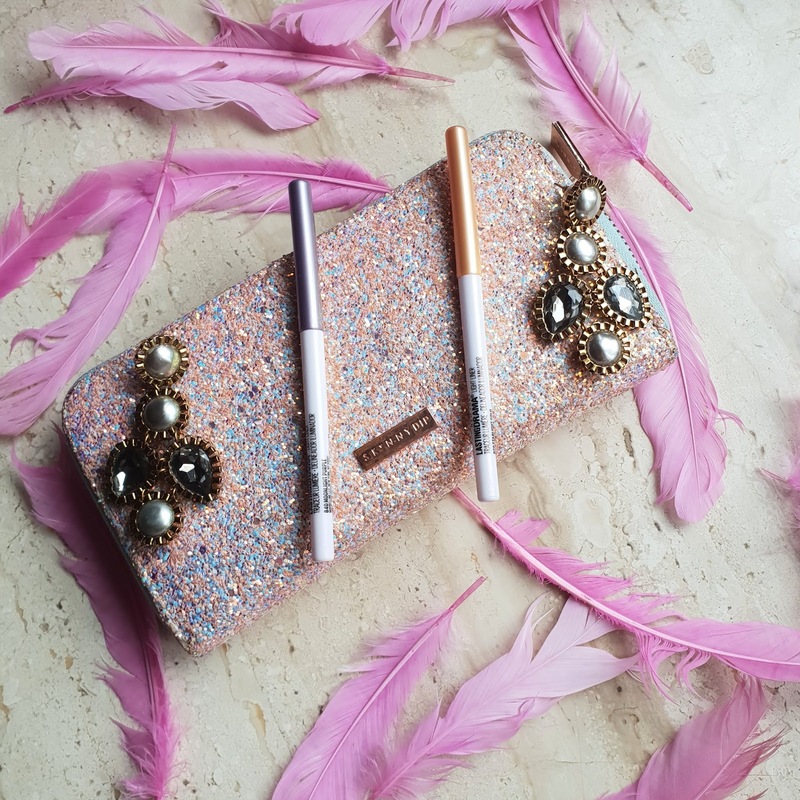 Now these liners can be used in the waterline or as eyeshadow on the upper lid. 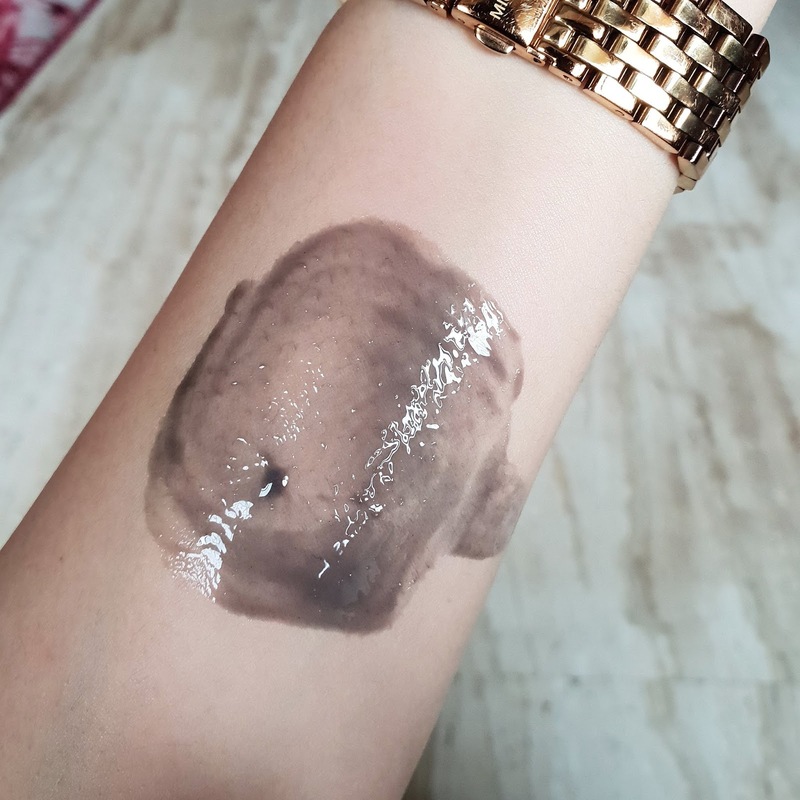 Also can be used for highlighting inner corner of eyes. It helps to give a bright eye look. It gives effortless application. Glides smoothly on to the lids. 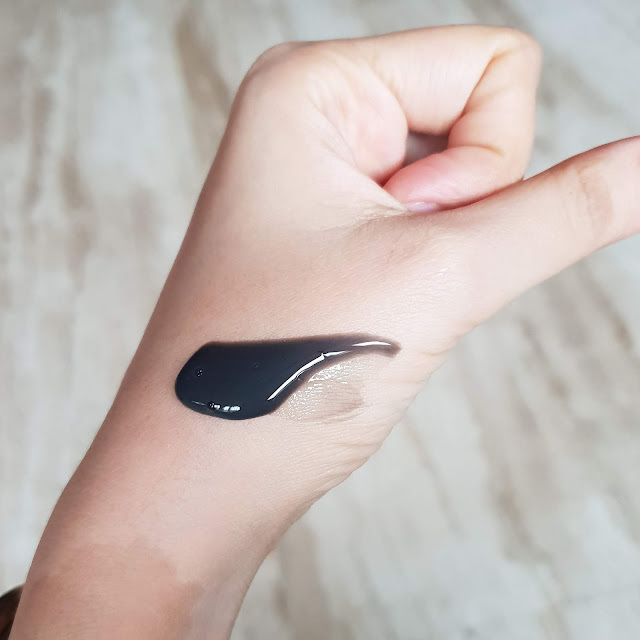 It’s a long lasting smudge proof waterproof formula. These shades have illuminating pigments which help to brighten the eyes. The textures is creamy and light weight which makes it easy to use. These pencils give a eye opening impact. It can be used on upper lash line, lower lash line as well as on waterline. 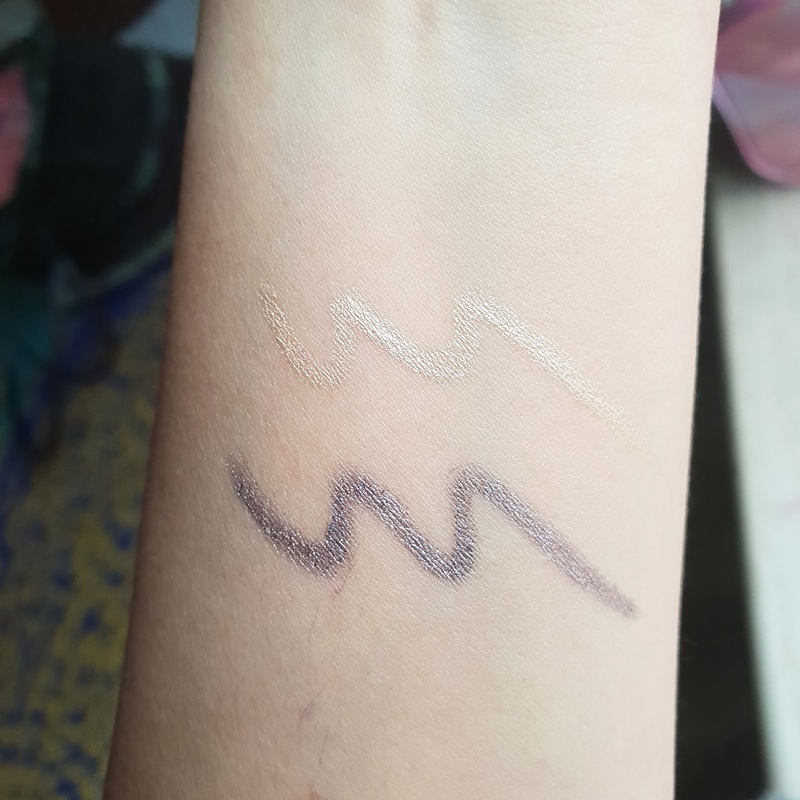 I love using this shades it can be used for everyday look too. It instantly makes my eye look bright and lustrous. I feel everyone needs to try these kind of shades for different look. Coming to color sensational shaping lip liner. Truly speaking I barely get time to use lip pencils and I am not too fond of it. But lip pencils are important as they not only help in shaping your lips but also make your lipstick last long. I love when my lips are well defined & Maybelline got 20 shades in this range. I thought of giving it a try by getting 3 shades DUSTY ROSE, MAGNETIC MAUVE & WILD VIOLET. They are creamy in texture give easy application. 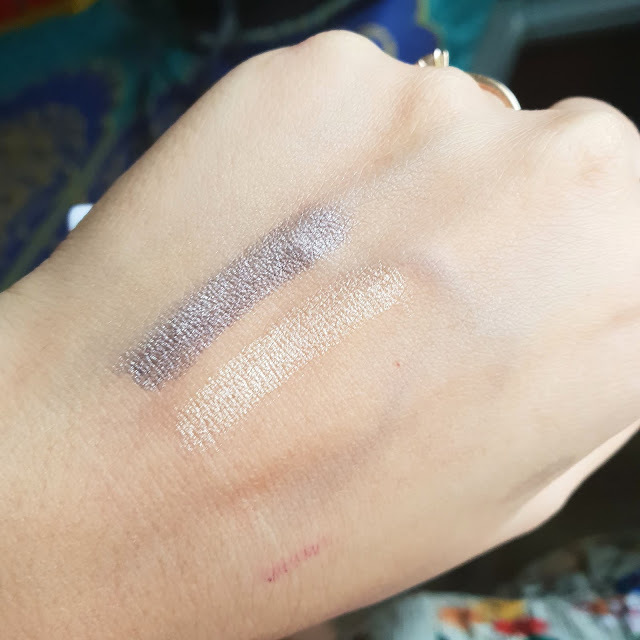 It’s a matte formula which stays for long. If you press too hard or drag it may break. There are lots of shade to match with your lipstick. 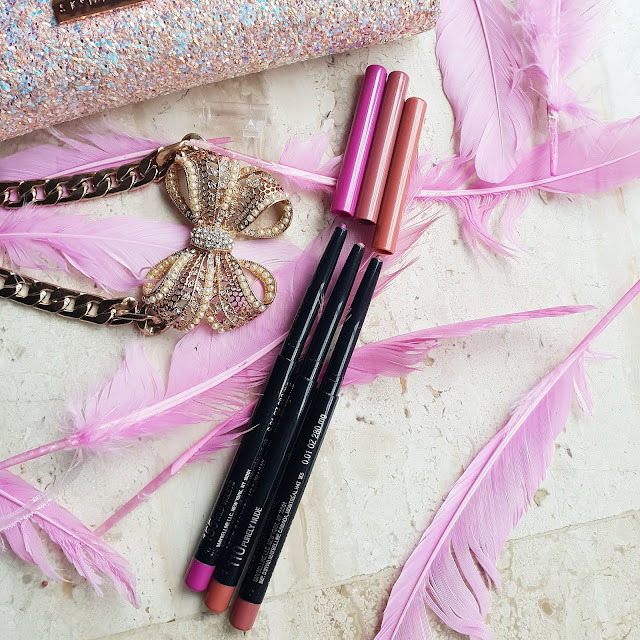 You can now create bold define look using this lip liners. It helps to give fuller looking lips. They come in black packaging with color coded cap. They are available at affordable price. 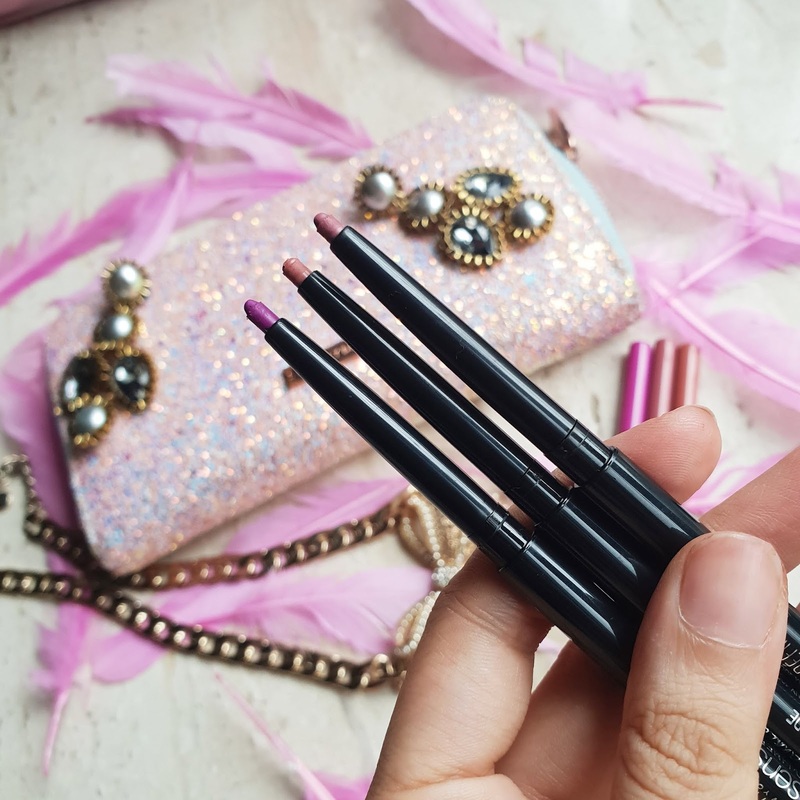 If you have dry lips these lip pencils accentuate and may feel bit drying. I do like to contour my lips also its very much in trend. 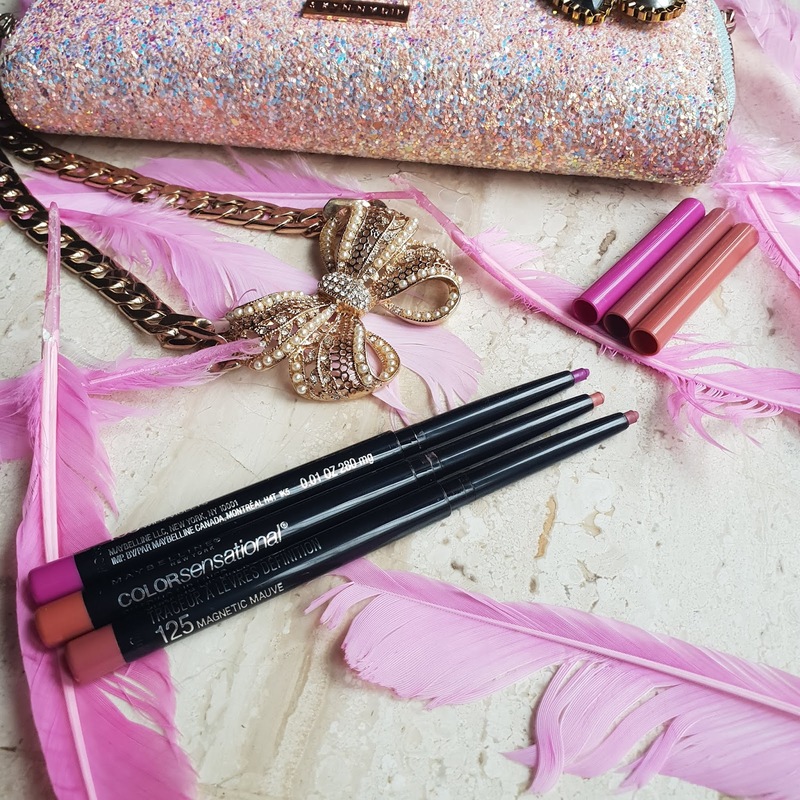 You can also use this lip pencils for contouring your lips. You can use darker and lighter shades accordingly. 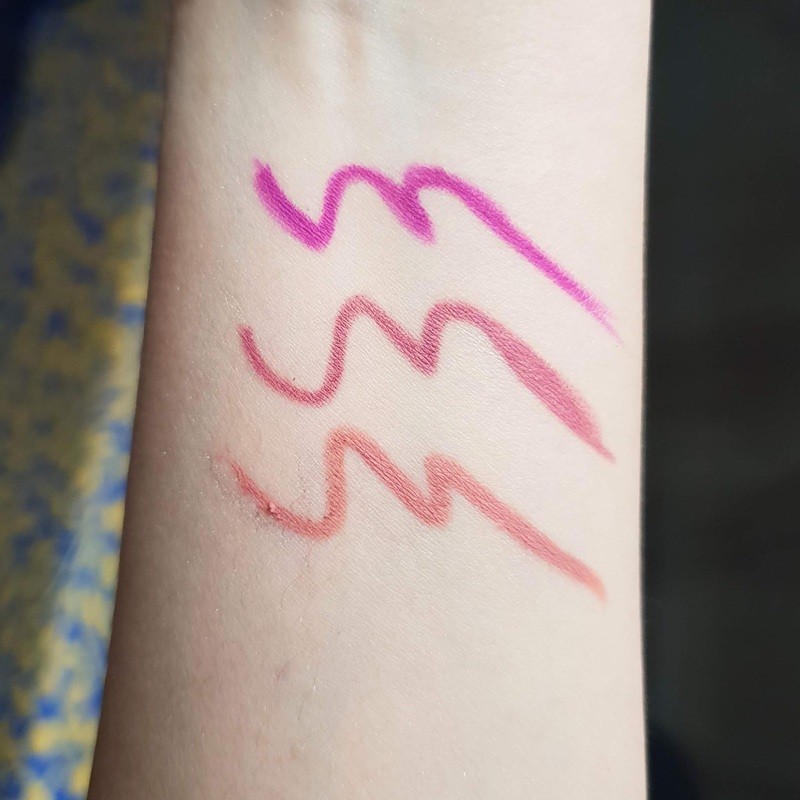 Overall if you love using lip pencils or want bold defined fuller lips do try them out. There are lots of shades to choose from find a perfect match and use them accordingly. You can also use darker lip liner for more bolder lips. Recently I have been obsessing over New skin care products and today I will be talking about New LOREAL PURE CLAY FACE WASH. Its yet not available in India but I you can get from online store. 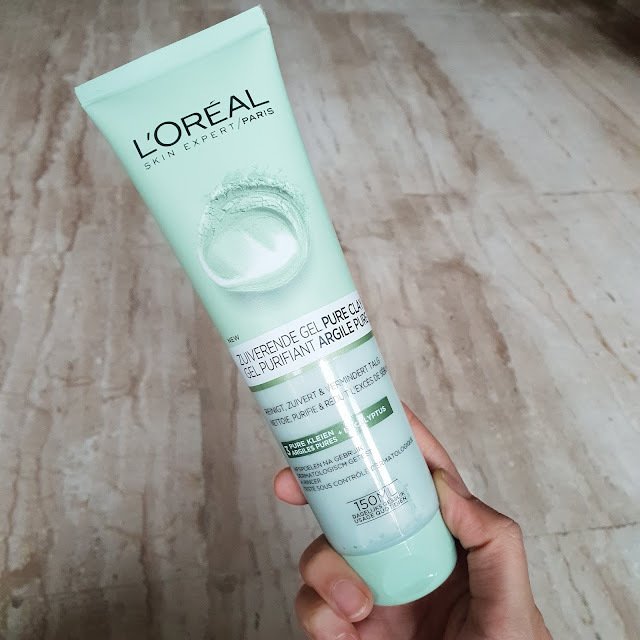 I have already tried loreal clay face mask and now I will be trying the face wash in same range. Just like clay mask these too are available in 3 different types. Detoxifying gel face wash, Pure Argile Eucalyptus cream face wash and Pure Clay Red Algae Exfoliating face wash. I have got two cleansers DETOXIFYING which is black in color and has charcoal in it. The PUREA ARGILE which has eucalyptus and comes in green color which is basically for mattifying oily or shiny skin. All face wash are soap free and dermatologically tested. These cleansers are suitable for acne prone skin and sensitive skin too. Argile face wash have thick creamy consistency which almost feels like clay mask and does contain mint fragrance. Basically all of the clay cleanser do contain fragrance. They help in removing dirt and makeup from skin. It cleanses my pores leaving my skin soft and supple. Detoxifying face wash comes in black color having thinner consistency and almost gel like texture. Its perfect for oily skin or acne prone skin. 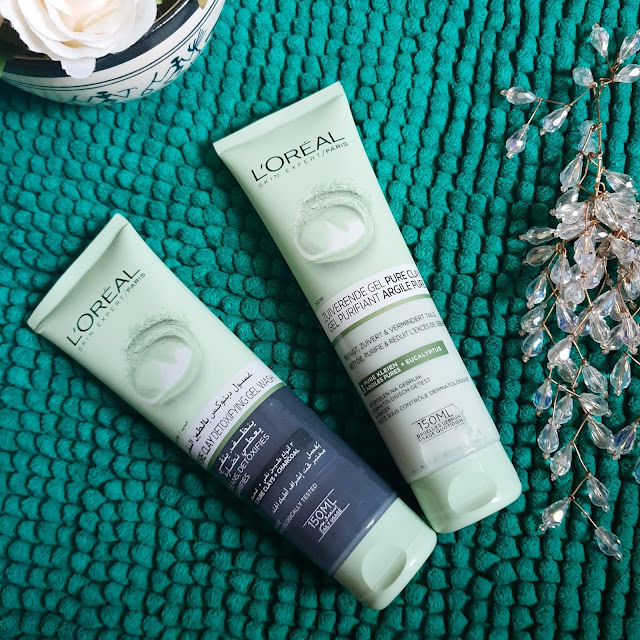 The charcoal face wash helps to detoxify skin as it contains magnetic properties. It cleanse my skin and removes all traces of makeup and dirt. I was more happy with the Argile as it left my skin smooth and I could feel the softness of my skin. Also it helps to brighten my complexion. These face wash are quite comfortable on skin it doesn't leave skin dry or oily. These cleansers doesn't foam much which is good enough for skin. Overall recommended the only drawback I found was the fragrance I like my face wash mildly fragrance. The effect of this cleansers was almost like using clay mask. These face wash is suitable for various skin type. All cleansers are mild and doesn't strip away natural oil from skin. 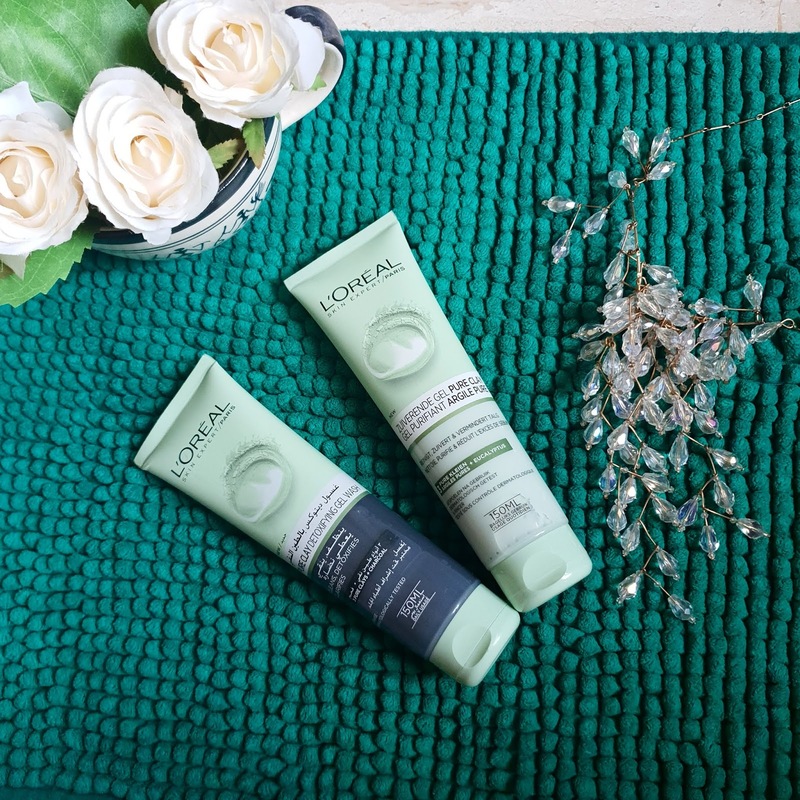 If you have dry skin you may need moisturiser after cleansing face. 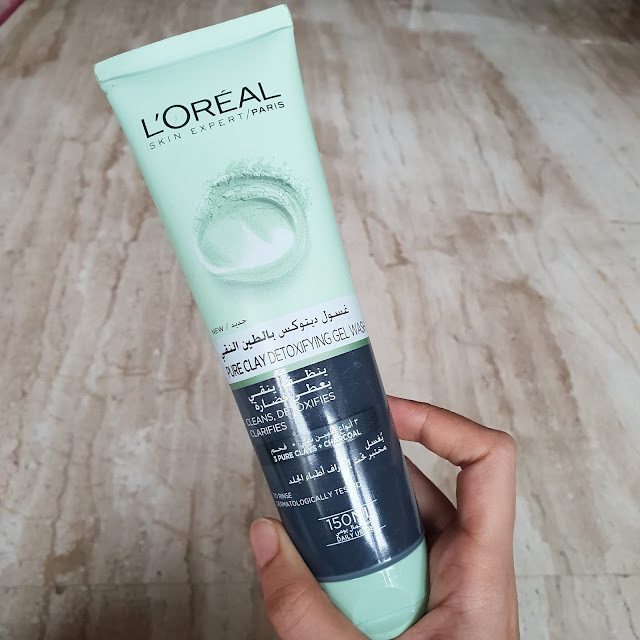 Have you tried out Loreal pure clay face wash whats your view on it? Hope you all have a great week ahead. Recently I am reviewing more of skin care products as age advances I feel the need for better skin care routine. So here comes Garnier Serum Mask. Now this is not the first time I am using serum masks. I have tried a lot more Brands before and I usually find all of them having similar effect. 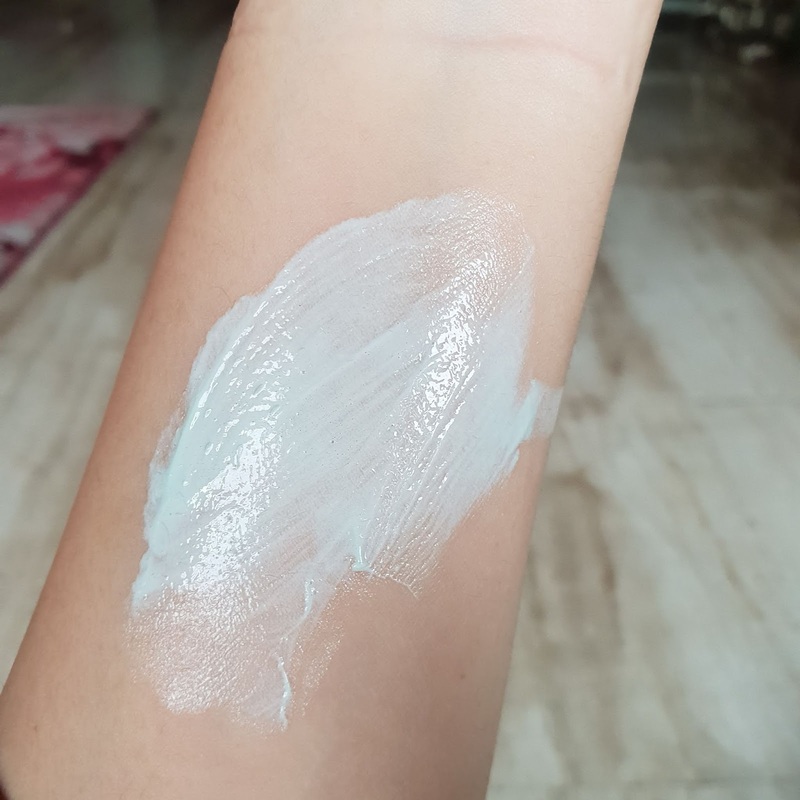 It refreshes my skin leaves it soft and smooth adding some glow for a day or two. 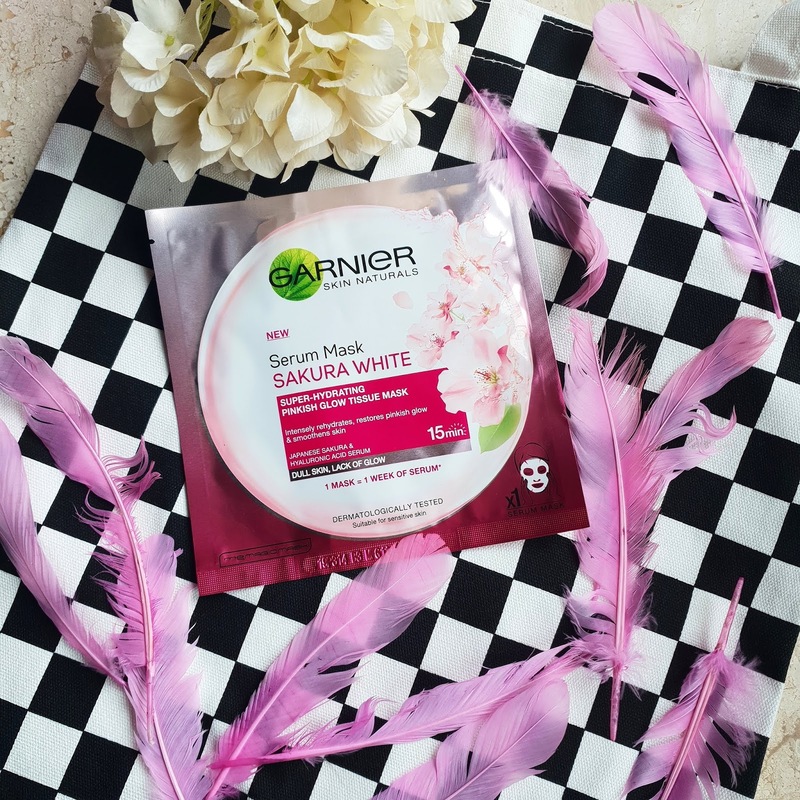 Coming to Garnier it has got three varieties Light complete, Sakura white Hydra bomb. These sheet mask has to be kept for 15 mins after removing the mask you can massage the left over serum into skin or you can also rinse it off. This sheet mask is stretchable and can fit easily on face. The mask is completely drenched into essence it has mild fragrance which can be ignored. It feels really soothing and comfortable on skin. I usually like using it in the night time so that I can leave the serum on my face. 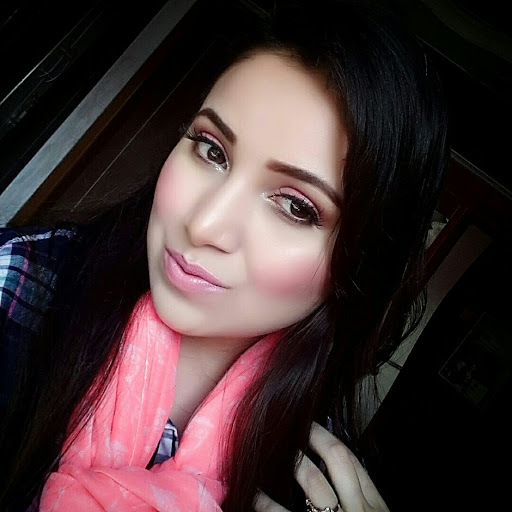 If you want to go for evening party you can wipe off excess serum and apply makeup over it. Light complete is more like a brightening tissue mask. While Sakura white is pinkish glow tissue mask and Hydra Bomb is replumping tissue mask. It claims 1 mask=1 week of serum.. Now basically serum acts on deeper level of skin and so it's needed in our skin routine. 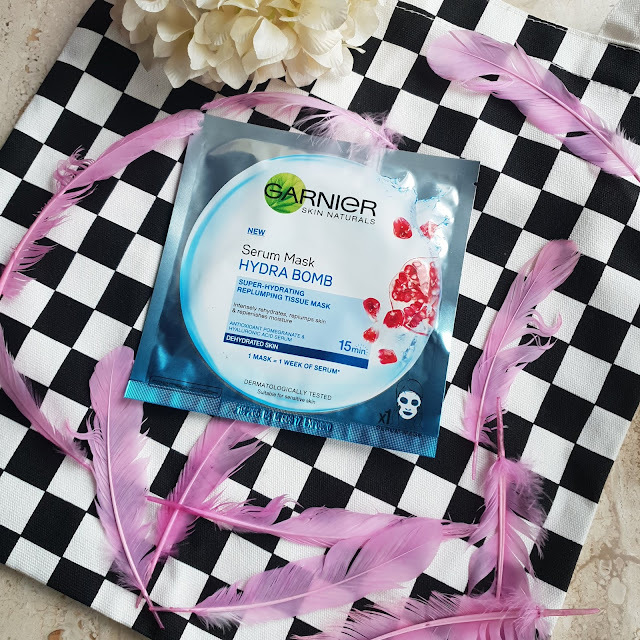 HYDRA BOMB MASK is infused with hyaluronic acid and pomegranate extract. It helps to reduce fine lines while providing intense hydration. This mask is for dehydrated skin. After application of this mask it doesn't make my skin oily or sticky instead it feels hydrated and plumpy. I could see the effect of this mask for around 4-5 days which is pretty good. SAKURA WHITE MASK is enriched with powerful Japanese Sakura ingredient. It also contains VITAMIN C AND B3 it helps to lighten spots and give a fresh radiant skin. After using this mask my skin felt much softer and smooth. I could see soft glow on my skin which lasted for a day or two. My skin felt moisturized for complete week. It didn't gave me any breakouts and sensitive skin can also use them. Also suitable for acne prone skin. Its mainly for dull tired looking skin. 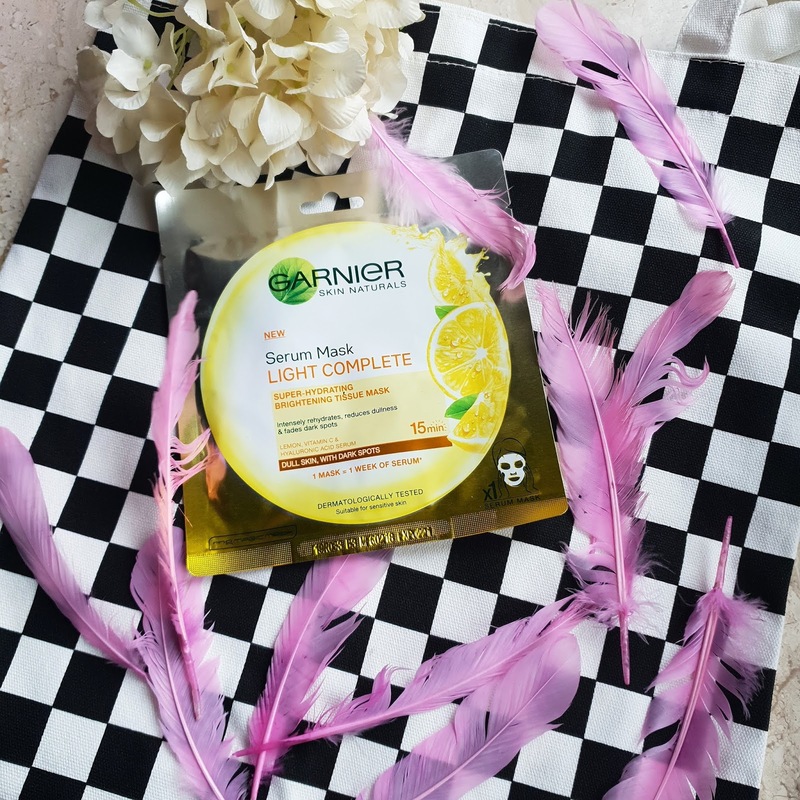 Coming to Light complete brightening mask it contains LEMON, VITAMIN C and HYALURONIC ACID. This mask helps to reduce dullness and fade dark spots. Also it rehydrates your skin completely. 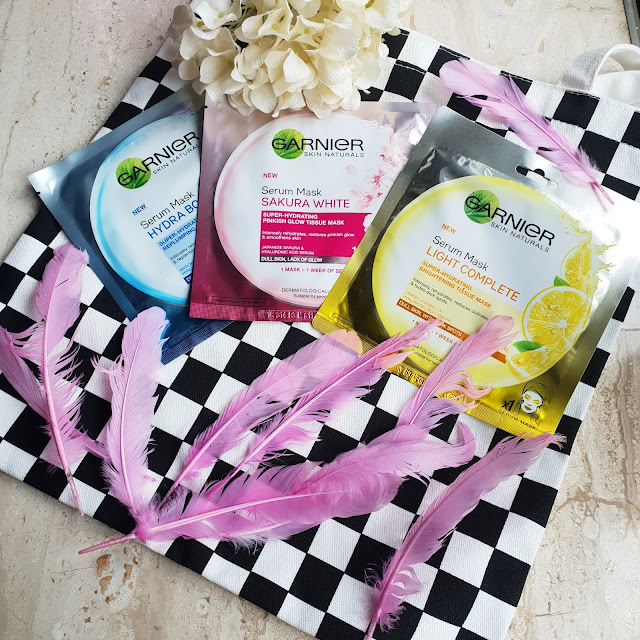 Overall Recommended these serum masks are quick and easy to use. The results are very temporary. If you need a quick fix to your skin you can definitely try them.